Parkinson's disease is a progressive, neurodegenerative disorder that affects movement, muscle control, and balance as well as numerous other functions. It is part of a group of conditions known as motor systems disorders. Parkinson's disease was named for James Parkinson, a general practitioner in London during the 19th century who first described the symptoms of the disease. Symptoms describing Parkinson's disease are mentioned in the writings of medicine in India dating back to 5,000 BCE as well as in Chinese writings dating back approximately 2500 years. Parkinson's disease is the most common movement disorder and the second most common neurodegenerative disorder, the most common being Alzheimer's disease. The hallmark symptoms of Parkinson's disease (PD) are asymmetric tremors at rest, rigidity, and bradykinesia (slowness in movement). There is currently no cure for Parkinson's disease; it is always chronic and progressive, meaning that the symptoms always exist and always worsen over time. The rate of progression varies from person to person, as does the intensity of the symptoms. Parkinson's disease itself is not a fatal disease and many people live into their older years. Mortality of Parkinson's disease patients is usually related to secondary complications, such as pneumonia or falling-related injuries. Adult-Onset Parkinson's Disease - This is the most common type of Parkinson's disease. The average age of onset is approximately 60 years old. The incidence of adult onset PD rises noticeably as people advance in age into their 70's and 80's. Young-Onset Parkinson's Disease - The age of onset is between 21-40 years old. Though the incidence of Young-Onset Parkinson's Disease is very high in Japan (approximately 40% of cases diagnosed with Parkinson's disease), it is still relatively uncommon in the U.S., with estimates ranging from 5-10% of cases diagnosed. Juvenile Parkinson's Disease - The age of onset is before the age of 21. The incidence of Juvenile Parkinson's Disease is very rare. Parkinson's disease can significantly impair quality of life not only for the patients but for their families as well, and especially for the primary caregivers. It is therefore important for caregivers and family members to educate themselves and become familiar with the course of Parkinson's disease and the progression of symptoms so that they can be actively involved in communication with health care providers and in understanding all decisions regarding treatment of the patient. According to the American Parkinson's Disease Association, there are approximately 1.5 million people in the U.S. who suffer from Parkinson's disease - approximately 1-2% of people over the age of 60 and 3-5% of the population over age 85. The incidence of PD ranges from 8.6-19 per 100,000 people. Approximately 50,000 new cases are diagnosed in the U.S. annually. That number is expected to rise as the general population in the U.S. ages. Onset of Parkinson's disease before the age of 40 is rare. All races and ethnic groups are affected. If you or a loved one has been diagnosed with Parkinson's disease, it's critical to learn everything you possibly can about this condition so that you can make informed decisions about your treatment. That's why we created the Medifocus Guidebook on Parkinson's Disease, a comprehensive 202 page patient Guidebook that contains vital information about Parkinson's disease that you won't find anywhere in a single source. The theories regarding the underlying causes of Parkinson's disease. The risk factors that may increase a person's chances for developing Parkinson's disease. The early signs and symptoms of Parkinson's disease that are often overlooked by both patients and doctors because the symptoms are subtle and the progression of the disease is typically slow. A detailed overview of the Unified Parkinson's Disease Rating Scale that is used by doctors to follow the course of disease progression and evaluate the extent of impairment and disability. How Parkinson's disease is diagnosed based on factors such as signs/symptoms, patient history, physical examination, and a thorough neurological evaluation. The medications that are commonly used to increase the levels of dopamine in the brain of patients with Parkinson's disease in an attempt to slow down the progression of the disease. Lifestyle modifications that have been shown to be effective for controlling motor symptoms in the early stages of Parkinson's disease. The role of complementary and alternative therapies in the management of Parkinson's disease. The prognosis (outlook) for people with Parkinson's disease and the important factors which can significantly influence the prognosis. The impact of Parkinson's disease on the quality of life of both patients and their caregivers. Important questions to ask your doctor about Parkinson's disease. A Guide to Recent Medical Literature on Parkinson's Disease - This section of the Guidebook contains an extensive bibliography of over 100 references to recently published articles about Parkinson's Disease in authoritative, peer-reviewed medical journals with links to the absracts (summaries) of the articles. These articles represent the latest advances in the field and focus on cutting-edge research, new developments, and the lessons learned from recently published clinical trials involving patients with Parkinson's Disease. This is the same level of that is used by doctors who treat people with Parkinson's Disease to keep abreast of the latest developments and breakthroughs in this specialized field of medicine. Centers of Research for Parkinson's Disease - We've compiled a unique directory of doctors, hospitals, medical centers, and research institutions with special interest and, in many cases, clinical expertise in managing people with Parkinson's Disease. The "Centers of Research" directory is a valuable resource for quickly identifying and locating leading medical authorities and medical institutions both within the United States and other countries who are considered to be at the forefront in clinical research and treatment of Parkinson's Disease. You'd have to spend days - or even weeks - attempting to compile your own list of doctors and medical centers but, with the "Centers of Research" directory, the information is already right at your fingertips. All you have to do is act on the information by selecting and contacting the experts or medical institutions listed in the directory by state and country. Organizations and Support Groups for Parkinson's Disease - The Guidebook also includes a directory of organizations and support groups whose goal is to help people with Parkinson's Disease by providing access to information, resources, and services. Many of these organizations can answer your specific questions, enable you to "network" with other patients, and provide guidance in areas such as financial, social, or medical-legal issues. This valuable directory of organizations and support groups includes complete contact information, including phone numbers and E-mail addresses. 20% Discount - For a limited time, you can purchase the Medifocus Guidebook on Parkinson's Disease at a special 20% discount off the regular list price. Your 20% discount will automatically be applied when you go to "Checkout". Order Your Copy of the Medifocus Guidebook on Parkinson's Disease Today! The Medifocus Guidebook on Parkinson's Disease is available in the following two convenient formats: Printed and Digital. 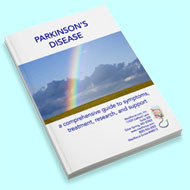 "I ordered the MediFocus Guidebook on Parkinson's Disease for my father who has had this condition for about 15 years. It was extremely useful to learn about the medications that are used to treat Parkinson's as well as the side-effects. I had read a lot of articles about Parkinson's on the Internet but they were all very general and vague. Your Guidebook provided excellent and comprehensive information from the medical perspective. Thanks for a very useful resource that is much needed today on the Web." "I found your Guidebook on Parkinson's to be very informative for me, the patient, and for my husband. I am in the process of changing my medication and the book explained more to me than the doctor attempted to. I am now more aware of what to expect. It also offered valuable advice for the caregiver. Thank you." "The Medifocus Guide to Parkinson's Disease was useful, informative, and allowed me to grasp the current fundamentals of treatment. I have recommended it to two of my ex-patients whom I know will find it readable and helpful to their needs."